EOSUSD worked exactly based on my analysis yesterday, it was able to overpower the blue drawn line which is the bullish price action activation junction at 2.364. I expect another leg of rising to happen soon, but this can not happen without a full correction, that yesterday rise was too heavy for a correction not to first come before bullish continuation. The stochastic oscillator has used the green line to cross the red line down, and the two are just leaving 80 zone, that means a correction will happen today. EOSUSD is bounce from red trend line support 2.220 and you can see its also breakout the blue trend line resistance level. Its good to enter into a long trade now EOSUSD and you can see OSMA is also above the zero and its price is also above from the moving average which is also a good sign for bulls of this instrument. Its price is now 2.754 and its possible today its close above the price 2.930. It is good to note the bearish price action on the 4 hour chart, it is building up and it is likely that it will come with higher pressure over the next couples of hours. I have being excepting a bearish correction since yesterday though, i will not be surprised when that happens. The blue drawn line which represent the bearish price action junction is at 2.748, strong bearish movement will be seen when that level is broken downwards. The stochastic oscillator is pointing lower too, this is buttressing the bearish analysis. The EOS-USD rate is 2.726 USD now. 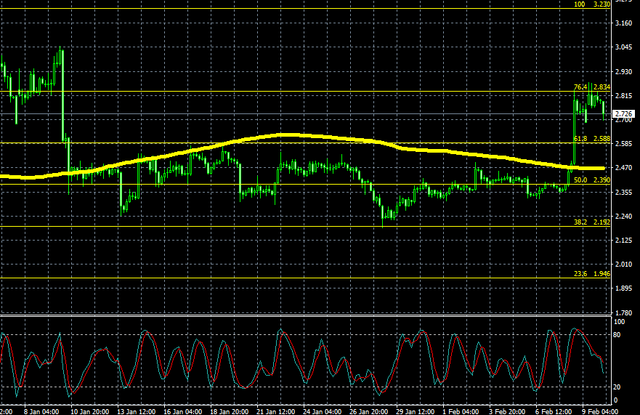 The price is below 76.4th Fibonacci retracement level, where it was on Friday after the strong bullish shift. EOS largely repeats the movements of other crypto-currencies. The following movement of EOS is not clear. Like in the case of BTC, I suggest to close most BUYs (there is a great income in them) and keep one order for a possible case of bullish continuation on Monday. Much will depend on USD vs. traditional currencies during the next week. EOSUSD Seems to be its top and color stochastic is show us overbought and you can see that color stochastic is near the 80 level and its good to sell its 80 level and its a good short trade for us and to enter into a short trade on EOSUSD near the red line at 2.810 price and its possible that price is move towards the previous low level at 2.390 price level. Where its make a new bottom for this instrument. EOSUSD will make some bearish correction today, it is showing some signs of an exhaustive market already, it is about to form a bearish price action, that will happen when it breaks below 1.764. That is what will give the asset further strength to approach the blue drawn line at 2.738, that line is the bearish price action activation junction on the 4 hour chart, and we will see a strong selling force when that level gives way to downside movement. The stochastic oscillator has used its green line to cross its red line downward, this is also supporting my bearish analysis. Color stochastic is start to move upside and you can see Eos is also start to move upside direction. Its price is 0.2781 and you can price is start to move upside and its target is near 0.2900 price level. All the crypto currencies pairs trend is now upside and to enter and exit from a trade on time we can make easily good profit but we must enter on higher and lower price level and do scalping on it is best idea for us. EOS/USD price is now move within triangle and you can see that its price is move within red trend line support and blue trend line resistance price level. Its make a false breakout and then again enter into a this triangle and now its seems that its trend is change to upside. I think now its good time to buy it after its breakout the upper blue trend line resistance and its target is above the 29.10 level.